Surround yourself with loving words, thoughts, and actions. 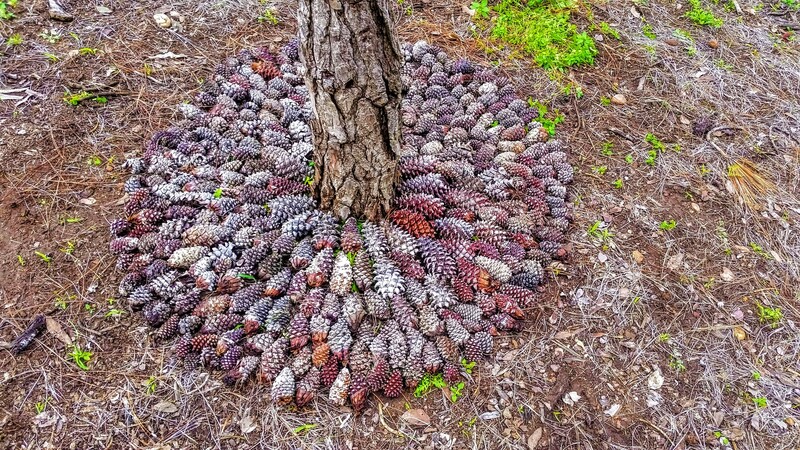 Just like I surrounded this pine tree with protective pine cones. – What do I need to do to feel loved and supported? – Do I have loved ones who support me? – If not, how can I support myself? Self-care means diving deep into our mental, emotional, and physical health. You can do this with journaling, meditation, and creativity. Do what feels healthy. Set boundaries with your addictions. If you need extra help, reach out to a loved one or mentor. Don’t hide when you need loving support. Ask for it. Find me on Patreon.com/Loviedo and on Ko-fi.com/Loviedo. As I embark on an adventure in Costa Rica, I have started journaling what I need for the next six weeks. Whether you are going on an adventure or just need more support in your daily life, I encourage you to start journaling. Write and manifest the support you need for your emotional and physical health. What do I need to feel loved? Am I receiving sufficient support from myself? Which of my needs require support from others? Who can I call for support when I feel sad or apathetic? Which people in my network are able to support specific goals? How can I reach out to my support system? Via phone, text, email or in person? How much alone time do I need and how much socializing do I need? Which self-care tools do I enjoy the most? Do I need to set stronger boundaries? If so, where? These are just a handful of questions that can help you focus on what you need. You don’t have to answer all at once, but the deeper you dive into your self-care/recovery work the more you benefit. This is a journal prompt you can do more than once. Bookmark this page in your journal to remind you that is okay, in fact it is necessary to feel supported and to ask for support when you need it. If you like this journal prompt, you can read more on my Patreon page. You can have access to even more once you become a patron. Be sure to check out the rewards you can receive when you pledge $3 or more each month. I’m an artist and writer on a mission to bring healing arts into the mainstream. If you would like to support my heart work, please consider becoming a monthly patron on Patreon.com/Loviedo. For $1 a month, you can fund programs like my D.I.Y. Therapy: Healing Depression E-course, my monthly “Radical” e-zine and other creative healing projects, like “Cultivating Radical Self-Love: A Collaboration of Healers, Artists & Writers“. Like the image above? It’s in my free coloring book, “Peace, Love and Weirdness”. Click Here to Download the Free PDF and color away.